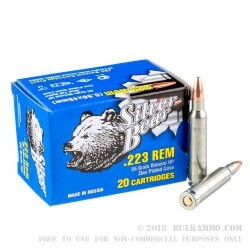 Silver Bear ammunition is made in Russia at the Barnaul Cartridge Plant and takes its name from its polished zinc plated Berdan primed steel casing. 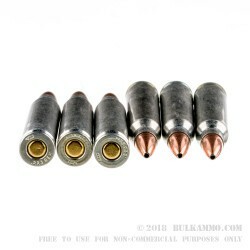 The cartridge’s plating provides consistent performance in your rifle by facilitating feeding, although its underlying steel still makes this casing unfit for reloading. Still, steel’s attractive price more than compensates for this cartridge’s unsuitability for handloading. 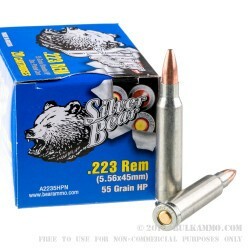 This 223 Rem cartridge features a 55 grain hollow point projectile. 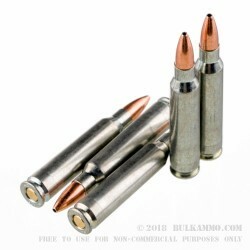 The cavity in the bullet’s tip will cause it to expand to significantly wider than the bullet’s original diameter upon impact, making this round appropriate for hunting and self-defense, especially if you favor an AR-15 for the latter purpose. The bullet’s jacket will help to prevent the rapid accumulation of lead fouling in your barrel, so you can enjoy more accurate shots before having to break out the bore brush.